Advertising junk food could soon be banned from children's content streamed online, according to the UK's advertising watchdog. 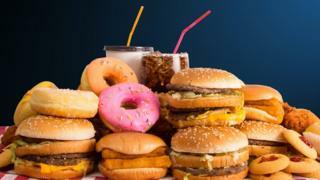 Ads for foods considered unhealthy are already banned on children's television, but not online. The Committee of Advertising Practice (CAP), which sets the rules for advertisers in the UK, will soon launch a public consultation on the issue. A ban could affect content on services such as YouTube and ITV Hub. Those rules are enforced by the Advertising Standards Authority (ASA), which also regulates "non-broadcast" ads such as print, billboards and online streaming. Many companies now use online video to promote products to young audiences. The ASA's chief executive Guy Parker told an audience at the Westminster Food and Nutrition Forum that he was often asked why junk food ads were banned on television but allowed during the same programmes when streamed online. The BBC understands the CAP will launch a public consultation on the subject before the summer.